Humanism has little place in U.S. global affairs these days when government acts as the enforcement arm of capitalism-run-amok. Especially since WWII, Washington has habitually aligned itself with the goals of U.S. corporations to dominate. In Latin America and elsewhere, it has funded armies of goons that harass, batter, jail, and murder labor leaders and their allies. In Colombia, labor organizers that call a strike put their lives at risk. It's a veritable shooting gallery where trade unionists are targets. In Iraq, writes Noam Chomsky in “Interventions”(City Lights Books), the occupying forces broke into union offices, arrested leaders, and enforced Saddam Hussein's antilabor laws. Union leaders were killed under mysterious circumstances. Concessions went to bitterly anti-union U.S. firms. New oil contracts went to firms whose executives were personal friends of President George W. Bush. At home, U.S. corporations---which exhibit zero loyalty to their employees and to the cities that gave them all those tax breaks to locate---put profits first even if it means stripping those cities of their plants; even if it means throwing thousands of loyal staffers out of work; even if it means cheating taxpayers by relocating their headquarters' offshore; even if it means hiring cheap foreign labor. “We are seeing the Financial Elite of America waging class warfare against the ordinary working men and women of this country who have made it what it is today,” says University of Illinois international legal authority Francis Boyle. At the same time, he adds, “the general population has gone through 30 years(1975-2005) of either stagnation or decline in real wages, with people working longer hours with fewer benefits. I don't think there's been a period like this in American history.” Meanwhile, corporations harvest record profits. It's no coincidence that as arms become America's No. 1 export, civilian jobs are going down the tubes. Columbia University economist Seymour Melman, interviewed in the Feb., 1992, issue of The Progressive, argued because of its vast expenditures for war the U.S. was “losing millions of productive jobs” in the civilian sector to foreign firms. “The U.S. economy is in dramatic disrepair compared to Germany and Japan. By concentrating capital on civilian purposes for 45 years they've emerged as the true victors of the Cold War,” Melman said. The record of history shows the White House has used CIA and Pentagon muscle to attack nations whose officials wouldn't play ball in the capitalist league. President Eisenhower gave the green light for the 1953 CIA overthrow of Iran. President Kennedy attempted to overthrow Cuba, but failed, in 1961; President Nixon succeeded in overthrowing the legally elected president of Chile in 1973; and President Reagan funded the Contras to wage war against the leftist Sandinistas of Nicaragua. When Cold War presidents gazed upon the world, all they saw was Red. War hero Jimmy Doolittle, who led the first U.S. air strike against Japan in 1942, later as chairman of a special task force reported to President Dwight Eisenhower that the U.S. “must learn to subvert, sabotage, and destroy our enemies by more clever, more sophisticated, and more effective methods than those used against us. It may be necessary that the American people be made acquainted with, understand, and support this fundamentally repugnant philosophy.” That, of course, is precisely what happened. The end began to justify any means. The Pentagon even uses its listening devices to steal business information to give U.S. firms an edge over foreign ones. Fear-mongering American politicians claimed that if just one country went Communist, all its neighbors would topple like dominoes. For decades, the U.S. subsidized anti-Communist Japanese politicians; the CIA secretly lined the pockets of mullahs and ayatollahs in Iran; and the Pentagon plunged recklessly into civil wars such as in Viet Nam using overwhelming force and violence. Ironically, at home the Justice Department, responding to the “Red Scare,” persecuted, tried, and jailed leaders of the U.S. Communist Party, for allegedly advocating the same strategies the Pentagon was actually employing on a massive scale the world over. Yet all the Pentagon's costly armaments designed to topple Red regimes proved less effective than the protests of the non-violent disciples of Gandhi, such as Solidarity labor union's Lech Walesa in Poland, who led the break out of the Soviet orbit. In Russia, President Mikhail Gorbachev, the advocate of Glasnost, or openness, could see that Soviet-brand Communism was failing his people and began to make changes that permitted private ownership of business. Similarly, strong-arm capitalism American-style today needs to be transformed. Starting wars to force other nations to privatize natural resources they would prefer to keep under public control is both reprehensible and criminal. In his treatise “On Human Work” in 1981, Pope John Paul II called for “the primacy of the person over things and of human labour over capital as a whole.” Workers must be paid fairly, allowed to form unions and strike for self-improvement and treated with dignity and respect. Let it be. 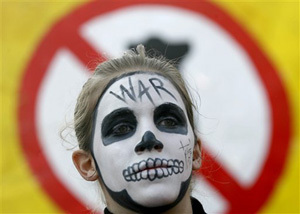 (Sherwood Ross is director of the Anti-War News Service from Coral Gables, Fla. He was active in the civil rights movement and later as a wire service columnist covering workplace issues. To contribute to his news service or comment, reach him at sherwoodross10@gmail.com).